I’m always amused when one of the newspapers crows about the latest circulation figures. THE Sunday Age continues to be the best-performing metropolitan newspaper in Australia, according to the latest circulation figures. The newspaper recorded the best year-on-year growth to September 2011 of any daily, Saturday or Sunday newspaper in the country. It takes a particularly selective use of the figures to come up with the headline “outperforms the rest”. In the article they quote the Sunday Age’s circulation of 228,826, but fail to mention the circulation of their competitors. The figures were all published last week. 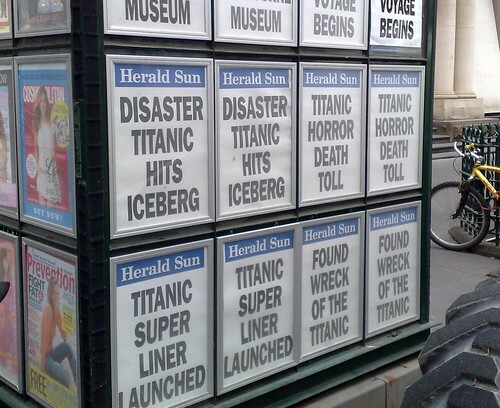 The Age is outstripped by their main competitor in Melbourne, the Herald Sun, every day of the week. While it’s true that the Sunday Age is growing in circulation (by 2126 in a year apparently), I think it’s rather optimistic to claim it “outperforms the rest” when it’s only selling 41% of the competition, and at this rate of growth (and the current rate of loss for the Sunday Herald Sun), it’ll take another ten years to get equal. I think I can understand why the gunzels find this irritating. All media outlets do this kind of thing from time to time — I’m only using an image from the Herald Sun here because they happen this morning to be showing two on the same page. 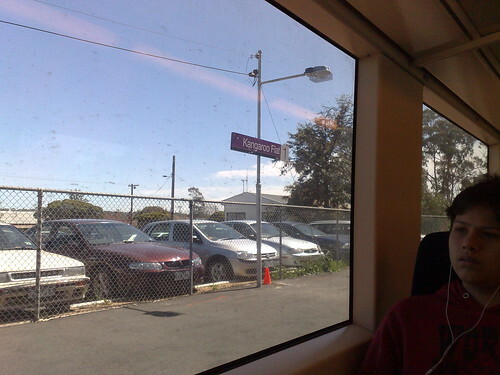 They have a story, say, something about trains, so they grab the first image from their library that matches the right keywords, and use it, without checking if it’s from the right city. 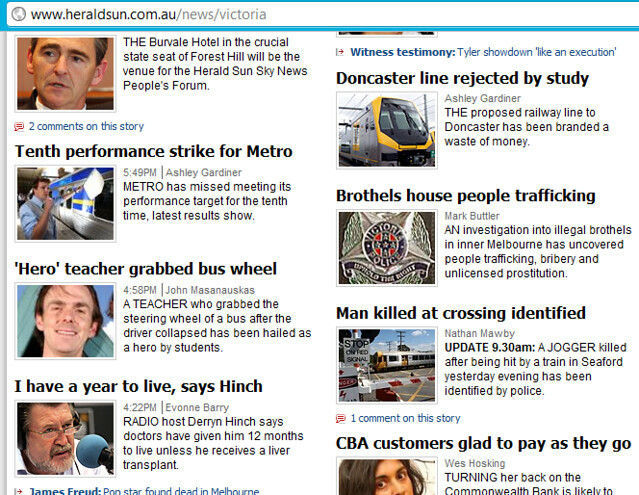 The Metro performance story is illustrated by the correct type of train and platform staff member. The picture may be a few months old, as most (but not all) of the Comeng fleet have now been done over in the new Metro colour scheme. Perhaps one out of three ain’t bad. It happens in other industries too. Those who work in IT will know that recruiters looking for people will try to fill jobs by looking for someone with a CV that matches some (but sometimes not all) of the keywords on the job description they’ve been handed by the employer… years ago I remember being asked if skill X1 was related to skill X2, because I had X1 but not the desired X2… alas, the skills were unrelated, or certainly not directly transferable. They’re special posters for the opening of the Titanic exhibition at the Melbourne Museum. Seriously, where do people get these ideas? It’s complete garbage. See, I’m all for bagging when it’s deserved, but this is just making stuff up. Where does that get you? In any argument, it’s pointless coming out with some BS like that. If you want your view to be accepted, if you want your criticism to sting, don’t fire blanks — make sure you’re using live ammunition. Research the facts, find out what’s actually true, that you can provide evidence for, and use that. Who are these clowns whose Twitter posts get into the paper? 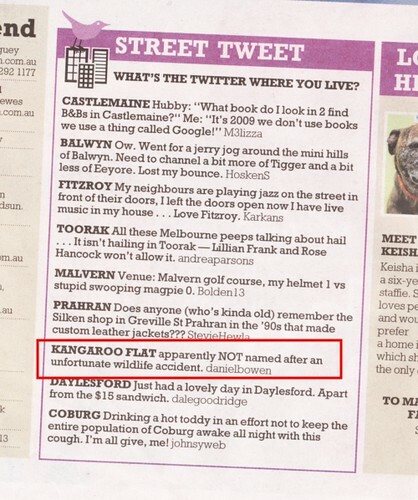 It was sent when we were passing through Kangaroo Flat on the way to Bendigo the other week.